Stop the fuss at the grocery store and in the kitchen with these delicious 5-ingredient recipes. 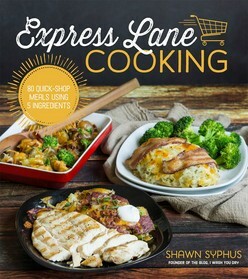 Express Lane Cooking takes five simple, whole food ingredients and shows you how to use them in at least three unique ways so you have an arsenal of impressive dishes for your family. Shawn takes ingredients like chicken, potatoes, cheese, bacon and broccoli and transforms them into recipes as diverse as Cheesy Potato Crusted Chicken, Creamy Broccoli and Potato Soup and Grilled Chicken with Loaded Smashed Potatoes. With a quick trip through the grocery's express lane, you'll have everything you need to create not one, but three perfect meals in minutes. When you have little time, which is everyday for most people, this book will give you options for putting a tasty dish on the dinner table for your family the easy way. Take your popular 5-ingredient cookbook and amplify it by offering three or more options for each set of five ingredients for variety.